President Pranab Kumar Mukherjee has reportedly accorded sanction to initiate the process towards appointing five more judges to the Kerala High Court.It is also reported that a list of 15 more judges to the Madras High Court has been forwarded to the President for his approval. 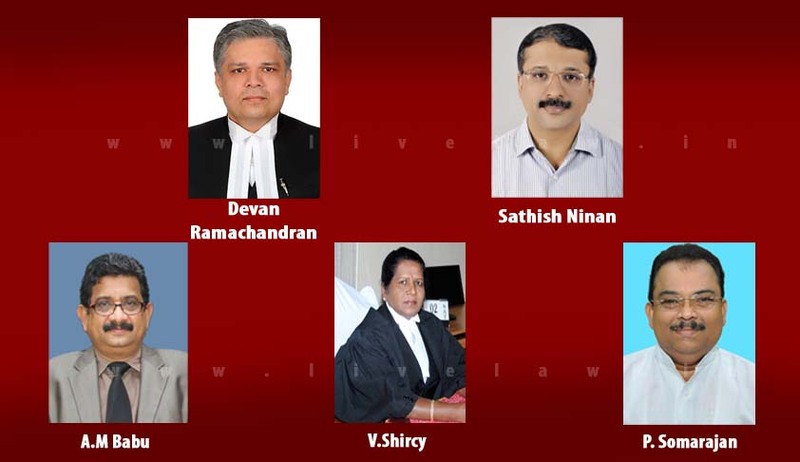 Senior Advocate Devan Ramachandran, Advocate Sathish Ninan, Kerala Judicial Academy Director A.M. Babu, Thiruvananthapuram District and Sessions Judge V. Shircy, and Pathanamthitta District and Sessions Judge P. Somarajan are tipped to be elevated as Judges. As per the Deccan Chronicle report, Advocates V. Parthiban, R. Subramaniam, M. Govindaraj, M. Sundar, R. Sureshkumar, Ms. Nisha Banu, M.S. Ramesh, S.M. Subramaian and Dr. Anita Sumanth, S. Baskaran, Basheer Ahmed, G. Jayachandran, C.V. Karthikeyan, R.M.T. Teeka Raman and C.V. Karthikeyan are expected to be appointed as Judges in Madras High Court in a couple of days. Senior Advocate Devan Ramachandran is the son of Senior Advocate Barrister M.P.R. Nair and Rathi Nair. Devan Ramachandran did his schooling from Bhavan’s Vidyalaya, Ernakulam, and, thereafter, took his law degree from Government Law College, Ernakulam. He started practice in 1991, under the guidance of his father. He was conferred with ‘senior’ designation by the High Court of Kerala, in 2015. Devan Ramachandran and his father are credited to be the first and lone father-son duo till date to be designated as senior advocates by the High Court of Kerala. Devan Ramachandran is further credited to have practiced in various modern branch of laws, including corporate, company and constitutional matters. In recognition of his eminence, the Kerala High Court had engaged his services to be its advocate when he was 35 years, making him the youngest one to do so till date. Devan was also standing counsel for the CBSE, various banking institutions, including the Indian Banks Association, the principal financial advisory mechanism to Reserve Bank of India. The High Court of Kerala had recently appointed Devan to assist as an amicus curiae in a suo motu Public Interest Litigation pertaining to the illegal trafficking of children from North India to Kerala. Advocate Sathish Ninan, who hails from Tiruvalla, is the son of former District Judge O.N. Ninan and Nalini Ninan. His paternal grandfather O.C. Ninan, too, was a senior lawyer. Sathish Ninan was the first rank holder in Law from the Kerala University in 1990. He did his post graduation in contract Law. He started practice in 1990 under his father. He later transferred his practice to the High Court of Kerala in 1995, under Senior Advocate S. Venkita Subrahmonya Iyer. He started practice independently in 2001, by forming his law firm with advocate Santhosh Mathew. He also held the position of standing counsel to various commercial institutions and corporate houses. Judicial Academy director A.M. Babu, who hails from Kanjirappally in Kottayam district, is the son of the late T.H. Mohammed Khan and the late Khadeeja Khan. He obtained his Law degree from Udupi Law College and, thereafter, got enrolled as an advocate in 1981 and started practice under advocate K. George in Kottayam. He joined the services of the state subordinate judiciary in 1988, as Munsiff, Kozhikode. He was promoted as Sub Judge in 1992, and further promoted as District Judge in 2002.